National RF’s HROII-PD and PDA precision dials were inspired by the earlier National Radio Company’s famous HRO series of communications receivers. This earlier equipment incorporated a ten turn dial with a rotating number plate on the inside. Every 72 degrees of rotation, a new number appears in a rectangular cutout in the dial skirt. The numbers count from 0 to 500 in decade intervals. The HROII-PD and PDA duplicate this counting action but in a smaller diameter assembly than the earlier dial. 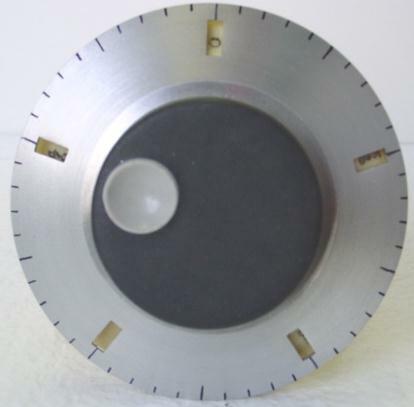 The HROII-PDA precision dial assembly includes the counting dial and mounting collar coupled to a ten turn precision potentiometer. The user may interface the variable voltage from the potentiometer to control a variety of devices, including varactor diodes in RF tuning circuits. The customer may select from three different values of potentiometers: 10,000 ohms, 50,000 ohms, or 100,000 ohms. Additional values are available upon request and additional handling cost. The HROII-PD assembly does not include the potentiometer assembly. The user is responsible for interfacing the dial to a 10 turn (minimum) drive. Please note that the PD assembly is not a vernier drive mechanism.